The category manager component enables you to define data categories which you can bind to dropdown fields in the interface. The category manager interface is grouped into two sections for editing System Categories and Custom Categories . System Categories are bound to system fields and cannot be deleted. Custom Categories are user-defined data categories. The Terminology Manager comes installed with a default set of custom categories which are bound to default custom fields . The category names are displayed in a tree view which illustrates the hierarchical nature of categories in the Terminology Manager. At the top level of the tree are the Category Names , which are collapsed by default. You can expand each category name to see the List Items contained within the category, and in turn expand a list item to see Sublist Items . The category hierarchy supports three levels of list items. You can use the list-item hierarchy to add sublist items and organize them into groups. The following example is taken from the ISO 12620 A.4 recommendation for domains, and illustrates how you can hierarchically organize the system category 'domain' in the category tree view. Click Terminology > Customize > Category Manager . Data Categories are essential for the management of any data, including terminology. According to the ISO 12620 standard Computer applications in terminology - Data Categories , data categories organize the data items which appear in individual terminological entries. In the Terminology Manager, the more general term 'field' replaces the ISO concept of the data category. The term 'data category' describes a more specific list of distinct values which you can edit to model a specific term attribute. In practical terms, a data category is bound to a dropdown field in the Terminology Manager interface, and populates the dropdown field with list items. Most data categories have the same name as the fields they are bound to. For example, the term edit page has a dropdown field labeled 'gender' which displays the list of items ​m​a​s​c​u​l​i​n​e , ​f​e​m​i​n​i​n​e , ​n​e​u​t​e​r and ​o​t​h​e​r from the data category 'gender'. The Terminology Manager enables you to edit existing data categories, to create your own custom data categories, and to bind these categories to new fields. For more information, see the topic Customizing your Data Model . When you click an item in the category manager tree view, a shortcut menu appears. To edit a category or list item, use the items in the shortcut menu. The menu items depend on the type of category or list item. For more information, see the relevant procedures ( Creating and Sorting List Items , Deleting Categories and List Items , Renaming Categories and List Items ). Restriction: This action is only possible for custom categories, and for the system categories: part of speech , language, and domain . Restriction: This action is only possible for custom categories. For more information see Deleting categories and list items . Rename Category Rename a category. Tip: To change the display name of a field, use the field manager . Sort List Items Sort list items in ascending alphabetical order based on their display names. New Sublist Item Create a sublist item underneath an existing list item. Restriction: This action is only possible for list items within custom categories or within the system categories: part of speech , language and domain . For more information see Deleting categories and list items . Rename List Item Rename a list item. Move Up Change the order of a list item when it appears in dropdown fields. Move Down Change the order of a list item when it appears in dropdown fields. Click Add New Category . In the dialog, type the name of the category. (Optional) Select the Display Name option and enter a display name for the category. Click the name of the category where you want to add a list item. In the shortcut menu that appears, click Add List Item. In the dialog, enter the list item name. (Optional) Select the Display Name option and enter a display name for the list item. Expand a category and click the name of the list item where you want to add a sublist item. In the shortcut menu that appears, click Add sublist Item. In the dialog, enter the name of the sublist item. (Optional) Select the Display Name option and enter a display name for the sublist item. Click the name of the category or list item which contains the list items or sublist items to sort. In the shortcut menu, click Sort List Items. The list items are sorted in ascending alphabetical order based on their display names. This action also changes the order list items when they appear in dropdown fields. Standard Name - The name of the category or list item as it appears in the API or in an export file. Display Name - The name of the category or list item as it appears in dropdowns within the interface. Important: If you regularly import and export terms, you should not rename the standard names of system categories . Style sheets for import and export use the standard names to map terminology information. If you change the standard names, it is possible that imports and exports do not work correctly. In the tree view, click the name of the category that you want to rename. In the dialog, enter a new standard name for the category. In the tree view, click the name of the list item that you want to rename. In the dialog, enter a new standard name for the list item. Click the name of the categories that you want to delete. In the shortcut menu that appears, click Delete Category . Restriction: This menu item is not available for system categories. The category manager searches for any list fields that depend on the category to display list items. If the category manager finds a dependency on the category, the category manager cancels the delete action and an error message provides you with a list of the dependencies. If there are no dependencies, the category name is removed from the category manager tree view. Click the name of the list item that you want to delete. Restriction: This menu item is not available for list items in the system categories lexical analysis mode , status , Boolean , and morphosyntactic restriction . The menu item is also not available if the list item is the default list item for the category. When you create a custom category, the default list item "undefined" is also created inside the category. Default list items are created because all categories must contain at least one list item. The category manager searches for any terms that have fields where the list item has been selected. If the category manager finds a dependency on the list item, the category manager cancels the delete action and an error message provides you with a list of the dependencies. Tip: To delete a sublist item, follow the same procedure as to delete a list item but instead select the option Delete Sublist Item . This menu item is always available for sublist items. In the Navigation Menu , click Customize > Category Manager . Click the Reload Dashboard button at the bottom of the page. Each component of the Dashboard is refreshed including the Terminology Manager. 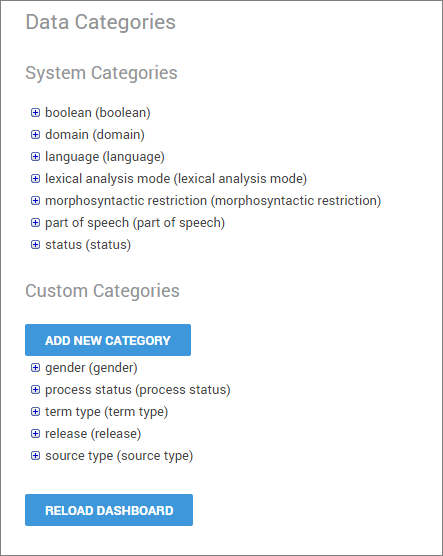 Any new categories, list items, and fields are loaded into the Terminology Manager interface.